Single Traveler Finds Adventure and Easy Traveling with Desafío Adventure Connections in Costa Rica! 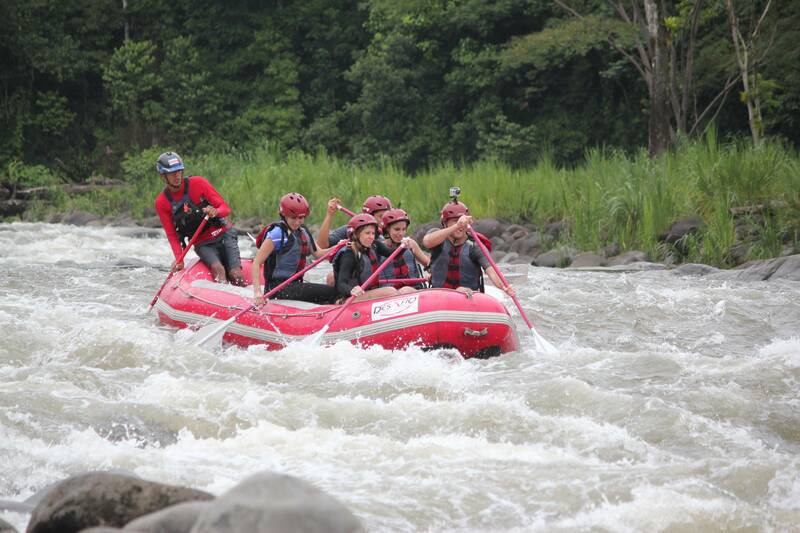 I arrived in #CostaRica with one thing on my mind… #WhiteWaterRafting ! I’d heard from friends about the legendary #RioToro, a class 3 and 4 river with continuous rapids that are guaranteed to thrill. So with that, I had made up my mind that this was the river I wanted to raft! While in San Jose, Costa Rica’s capital, I learned about an #adventure outfitter that specialized in #rafting in #CostaRica called Desafio Adventure Company. Once contacting them, I was surprised to find how easy it was to organize my trip! This is a pretty sweet deal I thought, so “Sign me up! I said.” I made a payment via PayPal and got a confirmation about the shuttle-tour right away. Sure enough, the Desafío van picked me up from my hostel the next day … and on time I might add! (when traveling #CentralAmerica, you really appreciate and take notice when things are on time, since most things seem to always run a bit late, or as they say “on Latin America time”). I quickly finished my coffee (again, I was expecting it to be late), got my bags and water shoes, and we were off. I was so surprised when the driver explained to me I could connect to the internet during the trip since the vans were equipped with FREE WiFi! What a bonus – I then FaceBook’d all of my friends to make them jealous about my adventures in Costa Rica. A couple of hours of a scenic ride later, and VOILA! We arrived at the river! Once there, our #rafting guide José introduced himself and we joined a group of other travelers that were already there waiting for us who came from La Fortuna. He proceeded to give a briefing, which I was very happy about since my excitement had turned to nervousness once I saw the rapids. The one thing I remember most, “don’t let go of the t-grip of the paddle or you’ll knock people’s teeth out”! Good advice I thought. I was a #singletraveler, so I was grouped with four others, they seemed nice enough, but to myself I was just hoping that they’d also remember not to let go of the paddle’s “t-grip”! We boarded our raft, practiced turning for a couple of minutes, our guide yelled out the command “forward paddle”, and we were off. We turned a corner and immediately after, the rapids began. It was one after the other. Then I heard it. Our guide yelled out another command… this time it was “get down”, I don’t know if it’s because I remembered what the guide said in the briefing, or because I was just automatically reacting not to fall off, but I stopped paddling and pretty much threw myself inside the raft (yes, I held the t-grip! ), hung on to the rope, and hoped that I wouldn’t fall out. Water splashed all over the raft and I’m sure that there wasn’t a dry place on anyone’s body! WOOOO HOOOO!!! What a ride! We continued on, “Hang On” the guide would say, the adrenaline was pumping through me, getting more water splashed at me then probably any other time in my life and having a great time. Until in the distance, I could see a harp turn. The guide slowed the raft down to remind us of another command… “Over-right / over-left”, which means that everyone who is not on the side they call out, has to stop paddling and throw their bodies to the other side. Since I was on the left, I stopped paddling and did just as I remembered, and threw myself to the right side… but we must’ve hit it hard or something because next thing I know I was in the water going down river. Seconds seemed like minutes, but the guide wasted no time and came towards me with the raft until I was beside it. He grabbed my lifejacket and in one smooth motion, pulled me back inside the raft. What a glorious moment! I thanked him, he smiled, gave me back my paddle and we were off again. I managed to stay in the raft for the remainder of the trip, but at least I had a nice story to tell my friends back home. But wait, there’s more. We got back in the shuttle, smiles glued to everyone’s faces and we continued to a restaurant that had a beautiful views of green hills in front, hummingbirds in front of us and we were served a delicious typical Costa Rican lunch. Far better than I had anticipated! With my heart filled with adrenaline, and my stomach with yummy food, we were off to La Fortuna… crazy thing is, after arriving in La Fortuna, I learned that the adventure was just starting! #Canyoneering, #Hiking, #StandUpPaddling, #Biking, #Horseriding and #Ziplining are just a few of the adventures available throughout the country and Desafio Adventure Company is THE place to experience them in Costa Rica. I give #Desafio two thumbs (…and a paddle ;-) way up! And their Desafío Adventure Connections are THE way to go! PS. A big thank you to my river guide José for saving me! Count on Desafio Adventure Company for Costa Rica Incentive Travel Planning by Christine Larson-Krishnan Several years ago the Miami Dolphins' executive board came down to do some Team Building Activities in Costa Rica with us. We took them raf.. Continuing Education in Costa Ricaby Christine Krishnan, Community Outreach Many people are curious about what Costa Rica is like before they come to visit. One of the questions we get the most is: "I don't speak Spanish. Will it be hard for me.. Imaginative Recycling Projects and other fun activities with School Children in Costa Rica by Maichal Ledgster, Desafio Adventure Specialist The Desert Garden Montessori school from the United States asked us to help them with a fun recycling proje..
From our Kitchen to Yours: Fresh Flavors from the Desafio Kitchen by Christine Krishnan, Desafío Adventure CompanyI remember several years ago we launched a new tour kayaking and rafting down the picturesque Rio Arenal during the rainy season. The..